Namely to switch between Don’t allow remote connections to this computer and Allow remote connections to this computer. 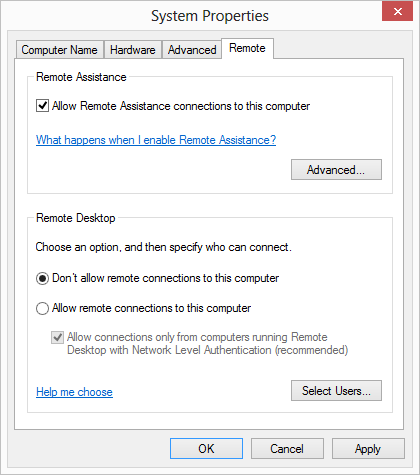 Then, on selecting the latter, to control Allow connections only from computers running Remote Desktop with Network Level Authentication. Win32_TSGeneralSetting via the SetUserAuthenticationRequired method, enables and disables the need for the user to be “authenticated” – which actually means enable and disable NLA. The script below allows you to set all the options on either a remote or local computer. To change the local computer set the ComputerName parameter to localhost or just a full stop (.). Write-Host "Remote Connection settings changed sucessfully"
Write-Host "NLA setting changed sucessfully"
I should probably make this into a cmdlet (or maybe Microsoft might have cared to do that for us all in the first place…!). This entry was posted in PowerShell, Remote Desktop, Windows and tagged connections, disable, enable, network level authentication, nla, powershell, remote desktop, SetAllowTSConnections, SetUserAuthenticationRequired, Win32_TerminalServiceSetting, Win32_TSGeneralSetting, windows. Bookmark the permalink.